A lovely book with an ugly title. I would not have taken it from the shelf had not the librarian handed it to me in lieu of Roger Fry’s study which was out. As it was, it was some time before I got round to opening it. It is a layman’s response to Rembrandt, in the sense that Taylor is best known as a translator. He teaches at the Parsons School of design in Paris and I guess these chapters were first a most inspiring slide-lecture series to students there. I suspect he has never been subjected to a course in art history, or if he has, his sensibility has survived the blinkers, unimpared. If the book were made into a television series I guess it would do more to save Rembrandt than my rather more technical approach. The chapter which looks at Rembrandt’s treatment of blindness is wonderful. For me, Taylor has rescued Rembrandt’s etching of “The Blind Tobit” from the doldrums and shown me a great and subtle work; (see caption below) so very different to Kenneth Clark’s treatment of the same subject. Taylor sees Tobit, in his excitement, has overturned the spinning wheel and, disoriented stumbles towards his own shadow rather than greet his son, Tobias, at the door. Tobias has just returned from a great adventure, his dog precedes him and is about to cause yet another mishap. I am right with Clark when he talks of “deep secreted experience” but as for the rhythm and pose being similar, surely complete nonsense. Clark has an acute eye but it has been deformed by modern trends in art history: “mere observation” being a hallmark. Modern critics of art should try a bit of observation for themselves, they would soon find that it is a most demanding process requiring a life-time of vigilance. Yes, of course Rembrandt knew Veniziano’s engraving after Raphael ( he owned a huge collection of such things) but Rembrandt’s reaction was more probably the same as mine: “child’s play; Blind-man’s-Buff, I’ll show them blindness” and then goes on to produce this little masterpiece. Yes, artists do secrete experiences. Long forgotten memories bubble to the surface in the act of observation and it is this that activates Rembrandt’s empathetic imagination. The sooner the “experts” recognise this method the sooner we will get back on track with Rembrandt’s genius. Taylor has a lot to say about Rembrandt’s noses but in the end it is Taylor’s nose that leads us on this enlightening, humanist tour of Rembrandt’s gifts to us. You can vote in the poll illustrated below. You must go the the SaveRembrandt site to vote. See bottom right of page for Poll. You will not be able to vote on this blog. Konstam’s arguements are very convincing,they need to be published. This is the real Bol as draughtsman, not very inspired. If anyone has access to better photos of the Bol paintings we would be very pleased to replace the miserable versions we have had to use. Read, mark, learn and inwardly digest the commentaries of Rembrandt’s contemporaries. Recognise the fact that Rembrandt used live models and mirrors regularly in his studio, creating tableaux-vivants for himself and his students to work from. Recognise the variable quality of his works as seen in the etchings and paintings, which are usually dated and signed. Recognise that it is therefore dishonest to continue to impose a hypothetical development on his drawings very few of which are signed or dated. Recognise that the man himself (revealed in his behaviour) is not reliable (get a psychiatric report). Recognise that “he was taught by nature and by no other law. Anything else was worthless in his eyes”. “He would not attempt a single brush-stroke without a living model before his eyes” quotes from Rembrandt’s contemporaries. Ask advice of recognised draughtsmen – always. Study the syntax as well as the handwriting. Abandon the absurd belief that we would understand Rembrandt better if there was less of him to study! He was hugely prolific. Close down all the leading schools of Rembrandt studies and throw out the old guard, they have done immense harm to Art and are a disgrace to Learning, because of their refusal to accept no.1. above. Civilized debate is not tolerated by them. Open new schools with artists in charge. Publish my book written in 1978 and accepted by Phaidon (with all the editorial board behind it, until one nameless American scholar torpedoed it unjustly in his reader’s report. The book needs the minimum of revision and could be greatly enlarged. The book does of course call in question 90% of scholars’ dating and the iconography of Rembrandt and his school. Publish my Commentaries on the Published Drawings of Rembrandt. (in preparation). Do you remember a Rembrandt we considered the artist who had taught humanity more about humanity than any other? A kind of Shakespeare of the visual world, that Rembrandt can be restored. It is just a matter of how we look at him. For generations Rembrandt scholars have been “arranging” Rembrandt’s paintings and drawings into a smooth and reliable development but Rembrandt was not reliable. They are trying to knock a square peg into a round hole and have nearly destroyed him. We have lost sight of nearly half his works as a result, through de-attribution. There is an alternative view. A view that is entirely in accord with the reports of Rembrandt’s contemporaries and with the established facts of his life and art. It fits the facts so well that the scholars will not argue with it – they ignore it. Rembrandt was not reliable, he did not follow artistic precedents in the approved scholarly fashion “he was taught by nature and by no other law” his contemporaries tell us and this judgment is born out by the works themselves. His inspiration came direct from life as he experienced it. His right brain was feeling life more acutely and expressing it more potently than any other artist before or since. Add to that the very strong indication that Rembrandt was a bi-polar, manic/depressive type, who has been studied by scholars with an obsessive desire for order and you get the present disaster in scholarship. Would you try to date the letters of a manic/depressive by his handwriting? That is what has happened. Nigel Konstam, the “New Humanist” sculptor, would be happy to show you the alternative Rembrandt, whose art he has been studying for 50 years. His Rembrandt is bigger, bolder and altogether more human than the Rembrandt the scholars have been chewing over in that time. As predicted there are plenty of absurdities at the Getty exhibition of “Drawings by Rembrandt and his Pupils”, some you can now see on line. When I receive the catalog there will be more on this blog. 4. Landscapes – I do not comment on the landscapes. 6. House on the Bullwark – I do not comment on the landscapes. I have devoted perhaps a quarter of my life’s energies to saving Rembrandt, despite the fact that my efforts clearly earn me negative brownie points with the powers that be. At considerable expense I published three news-sheets 1991-2-3 to alert people to what has been going on. More recently I have put up www.saveRembrandt.org.uk which gives a pretty full account of what I see in Rembrandt and what the “experts” fail to see. I have received many verbal endorsements from artists, students and The Save Rembrandt Society but I need public written endorsements or my lonely crusade will founder and be forgotten. Recently at The Getty in Los Angeles there is an exhibition of Rembrandt and his Students’ Drawings, which undoubtedly propagates the establishment’s judgments made over the last 30 years. Many ludicrous judgments have already entered the annals of art history (in the catalogues of The British Museum, The Rijksmusem and the Boymans in Rotterdam) I am thinking particularly of those where perfectly obvious studies for well known Rembrandt etchings have been de-attributed because the scholars want him to be bolder, not as “tentative” as in his etchings! Now is the time to act, if you do not these very damaging judgments will blight Rembrandt’s reputation for many years to come. Do not expect art historians to be self regulating after 35 years of silent acquiescence in the ludicrous judgments of the “experts”. I surely need not remind you of the negative effect Rembrandt’s fall from grace has already had on the teaching of art. At the age of 77 I cannot hope to be around for another such opportunity as The Getty presents. I am reconstituting The Save Rembrandt Society as an internet blog. You will find it [coming soon] on www.verrocchio.co.uk. No fees required, just support. Please become a member and comment. If I am mistaken I want to know why. I have been scathing about the scholars ability to judge quality in art. Let me give two of the twenty examples I might have chosen. Rembrandt made many etchings of nudes, even the best are often marred by passages that are of inferior quality. Arnold Houbraken who was a painter and a contemporary of Rembrandt’s in Amsterdam, also an admirer was also very critical of Rembrandt’s drawing on occasion – “it is very seldom one finds in Rembrandt a well painted hand”– of his female nudes……“he has produces such pitiful things that they are hardly worth mentioning, they are invariably repellent and one can only ask oneself in amazement how a man with such talent and intelligence can be so stubborn in his choice of models.” – . 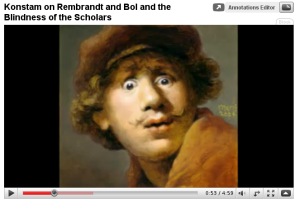 So we have been warned – Rembrandt is not always attractive. As a student I loved Rembrandt because he did not attempt to hide this variability. It was encouraging to see that even the great Rembrandt could live with passages that I felt I could out-do myself. He started from a ground base that was not all that exceptional, in fact quite ordinary. He was most unusually truthful about this and also about what he perceived. 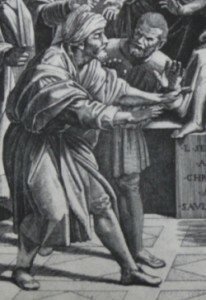 Look at this etching (The Arrow Holder) that has gone through many adjustments (changes of state), the hand holding the arrow, in fact that whole arm is badly drawn. When we compare it with the arm in the preparatory drawing B1147 we find there an arm that recedes much more satisfactorily. We can be absolutely sure that Rembrandt did the etching (he signed it on the plate) all previous scholars have accepted the drawing which although not exactly the same is clearly a preparatory drawing for the etching. (The drawing of the light on her back is identical given that one is done with a pen, the etching with a needle.) But Mr.Royalton Kisch, recently of the British Museum, has the arrogance to reject it. In spite of Houbraken’s warning he finds the drawing “frankly indifferent”. I don’t disagree but I don’t find that reason for saying it is not by Rembrandt. You may ask does it matter? – yes it very much matters because the style of this has been the reason for Kisch and his friends to relieving Rembrandt of many more drawings. This is one of many preparatory drawings that have been recently rejected. The “experts” should read the early documents every day till they change their attitude. They have no conception of how they have trampled on holy ground. The second example is much the same, only in this case the etching is all very poor in relation to the preparatory drawing which is a beauty and has been rejected by today’s “experts”. Look at the pose of the head, in the drawing a bony young man is seen leaning back on the wall behind (protected by a drape we see in the etching). The foreshortened features are beautifully seen but Rembrandt has lost it in the etching. The long bony face has become squashed (compare where the tip of the nose is in the drawing, it covers one eye, not so in the etching) Even allowing for the fact that Rembrandt has apparently moved further back for the etching, the youth’s lower legs seem very stumpy there, compared with the pose in the excellently descriptive drawing. These new findings were all published in the catalogue for an exhibition held in The Rembrandthuis Museum in 1984-85. (They will doubtless be repeated at the forthcoming Getty exhibition) Has any art historian raised his voice against them? Not as far as I have heard. The sad truth is that art historians are not very good at judging quality. There must be 10,000 trained artists out there who can see what I am talking about. LET US HEAR FROM YOU (in the comments section). It is surely part of an artist’s duty to help preserve the visual culture, which is now in terminal decay.